Omegalux® full-coverage drum heaters are designed to wrap around a drum and heat the contents while insulating to keep the heat exactly where it needs to be. Full-coverage drum heaters combine the convenience of quick heat-up time and the precision of a digital controller to provide the most practical, efficient means of freeze protection, viscosity control, and maintenance of materials at elevated temperatures. The dual zone drum heater provides a fully heated area with independent temperature control for each zone. It is designed to quickly melt heavy solids like molasses, syrups, etc. 6" wide strip that expands heater to fit up to a 24.2" diameter drum. Strip is necessary for heater to fit around drums with removable lids. 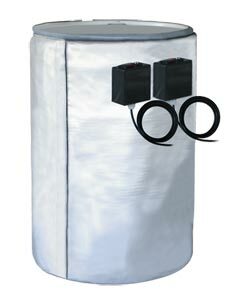 참고: All drum heaters are for 55 gallon size and come with two digital temperature controllers. For "Rolling Drums" with removable tops the standard full coverage drum heater may not completely wrap around the drum. For these drums with diameters larger than the standard 22.6" an expander strip may be purchased.